Soft-tissue expansion before total knee arthroplasty is a valuable alternative in complex scenarios of multiple conflicting incisions or soft-tissue contractures and scarring, presenting an effective prophylactic procedure to reduce the risk of wound-healing complication and soft-tissue coverage defect. Department of Orthopedics and Traumatology, Institute of Orthopedics “Carlos E. Ottolenghi,” Hospital Italiano deBuenos Aires, Potosi 4215, and 1199 Buenos Aires, Argentina. 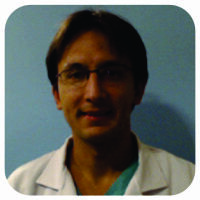 Department of Orthopedics and Traumatology, Hospital“Dr. 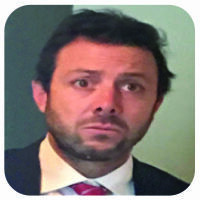 Federico Abete” de Malvinas Argentinas, Argentina. Institute of Orthopedics “Carlos E. Ottolenghi,” Hospital Italiano deBuenos Aires, Potosi 4215, and 1199 Buenos Aires, Argentina. Introduction: Wound complications are a feared complication following total knee arthroplasty (TKA). Furthermore, it is important to avoid underestimation in the pre-operative planning as it may lead to catastrophic TKA failure. Soft-tissue expansion (STE) has been indicated when insufficient or inadequate soft-tissue coverage is present before TKA as an alternative to optimize soft-tissue management. Case Report: We report two cases in which we performed, previous to TKA, a prophylactic skin expansion around the knee. Conclusion: STE technique to expand the available tissue for closure and healing after TKA is a valuable tool in the treatment arsenal, which can be implemented by orthopedic surgeons. 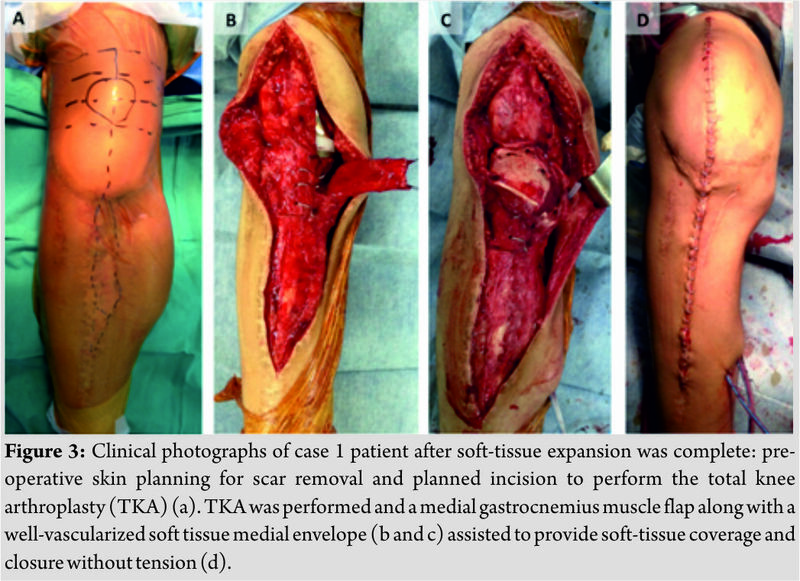 Keywords: Total knee arthroplasty, soft-tissue expansion, wound complications. Multiple-operated extremities, trauma, and scars in the anterior aspect of the knee may lead to contractile and adhered scar tissue to the underlying bone. That thin skin that is tightly scarred to underlying bone can seriously complicate the ability to achieve a successful total knee arthroplasty (TKA), leading to wound dehiscence and skin necrosis, with possible subsequent deep infection. Patients with wound-healing problems after TKA are at substantially increased risk for further complications, including deep infection and/or major subsequent surgery. Therefore, it is important to anticipate these potentially catastrophic complications before reconstructive surgery. Soft-tissue expansion (STE) techniques may be an alternative solution as they are indicated when insufficient or inadequate soft-tissue coverage is present to warrant successful wound healing . There are few reports of STE before knee arthroplasty in knees with multiple previous surgeries, which report favorable outcomes[3, 4, 5]. We, therefore, confirm these findings with the report of two cases in which we performed a preventative skin expansion around the knee previous to TKA. A 43-year-old male patient sustained an open comminuted fracture of the right tibial plateau from a traffic accident. The fracture treated at another institution required multiple surgeries including external fixation, irrigation and debridements, and posterior open reduction and internal fixation. Due to soft-tissue complications and persistent infection, hardware removal was performed 1year after initial surgery. 2 years after the accident, the patient consulted at our institution. Even as the infection seemed controlled, with no clinical signs of infection and normalization of erythrocyte sedimentation rate and C-reactive protein level, a bone biopsy was performed to confirm the absence of infection. During physical examination, the patient had multiple scarsaround the knee, with special concern with the adhesions to the proximal third of the tibia (Fig. 1aand 1b). At this point, TKA became an alternative as severe posttraumatic osteoarthritis was present (Fig. 2a), and the patient had a painful and limited active range of motion of 20°–60°. As the first-stage procedure, soft-tissue expander was used before performing the TKA. Two single remote-port tissue expanders (smooth rectangle – Mentor H/S, Santa Barbara, CA), of 700mL capacity, were placed subcutaneously into the medial and lateral side of the proximal third of the leg, respectively.2 weeks after placement of the devices, the lateral expander developed an infection and skin breakdown requiring expander removal, debridement, closure, and oral antibiotics (trimethoprim 160mg/sulfamethoxazole 800mg every 8 h for 14 days) with satisfactory outcome. 2 Weeks after this last procedure, saline injection was performed gradually at an approximate rate of 10% of the expander volume per week, taking into consideration that the capillary refill was not compromised in the overlying skin and the patient tolerated the rate of expansion. Nearly 40 mL of saline solution was injected into the medial device through the subcutaneous port weekly for 16 weeks for a total volume of 640 mL (Fig. 1c and 1d).Finally, in the second surgical stage, 13 months later, posterior stabilized total knee prosthesis (PFC SIGMA Total Knee System, DePuy Synthes, WestChester, PA) was implanted with gentamicin-impregnated cement (Fig. 2b).A tibial tubercle osteotomy was performed to facilitate exposure to the joint (Fig. 3). The use of the expander in the first stage along with a medial gastrocnemius muscle flap allowed adequate soft-tissue coverage while providing an improved gliding surface for the extensor mechanism(Fig. 3b and c). Thorough hemostasis was performed, and 2 drains were placed medially in the subcutaneous pocket where the expander was located. After tourniquet removal, we examined the viability and perfusion of the tissue flaps and proceeded to closure with interrupted subcutaneous layers and skin staples. We removed subcutaneous drains when the output decreases to below 50 mL per day 72h after the surgery. Immediate post-operative was uneventful. In the following months, the patient began to feel significant neuropathic pain in the area of the internal saphenous nerve. This pain was interpreted as internal saphenous neuritis following temporary relief of symptoms after injection of the affected area with local anesthetic. Along with saphenous neuritis, the patient evolved with limited range of motion 20°–70°. Hereby,7months after the surgery due to lack of improvement with conservative treatment, a new surgical procedure was indicated performing open arthrolysis and resection of the neuroma of the internal saphenous nerve. 1 month after the former procedure, the patient presented methicillin-sensitive Staphylococcus aureus periprosthetic joint infection that demanded a two-staged revision. The TKA implants were explanted, a static antibiotics loaded cement spacer was placed, and 6 weeks of intravenous antibiotics was performed. Finally, after four surgical procedures following the STE, the patient was re-implanted with favorable outcome, without soft-tissue complications. It is an important observation that despite multiple subsequent complications in the progression of this patient, there were no soft-tissue coverage difficulties after the STE procedures. The knee soft-tissue coverage obtained through STE allowed multiple successive surgeries without necrosis or coverage defect. At most recent follow-up,30 months after former TKA re-implantation, the patient showed improvement in active range of motion from previous 20°–60° to 0°–70° without extensor lag. The Knee Society Score improved from 39 to 85 after TKA at latest follow-up, and the patient was satisfied with the results achieved. 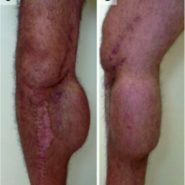 A 32-year-old male patient had a history of right knee septic arthritis at the age of 5. In that episode, Staphylococcus aureus was identified on culture and multiple debridement and articular lavages were required for the treatment, along with antibiotics. A muscular flap was performed to close the wound. The infection healed, but the patient suffered from severe chronic pain and had a limited active range of motion (from10° to 20°).The patient could neither walk distances greater than 500 mnor use stairs. An exuberant scar (16 cm × 5cm) attached to underlying tissue was observed at the anteromedial side of the knee (Fig. 4a).Similar to the previous case, pre-operative work up to exclude infection before TKA was done and normalization of erythrocyte sedimentation rate and C-reactive protein level was observed. A bone biopsy was performed and was negative for infection. As the first-stage procedure, two soft-tissue expanders were placed: one rectangular single remote-port tissue expander (smooth rectangle – Mentor H/S, Santa Barbara, CA), of 400mL capacity, was placed subcutaneously at the external aspect of the wound and one crescent single remote-port tissue expander (smooth crescent – Mentor H/S, Santa Barbara, CA),of 500mL capacity, was placed subcutaneously medially (Fig. 4b). After this first procedure, the patient used a knee immobilizer for 1week, and 2weeks after expanders placement, saline solution began to be injected into the devices through the subcutaneous port weekly for 12 weeks for a total volume of 500 mL (internal expander) and 370 mL (lateral expander). The saline injection was performed gradually at a rate of 10% of the expander volume per week, taking into consideration that the capillary refill was not compromised in the overlying skin, and the patient tolerated the rate of expansion. Finally, the second surgical stage was scheduled 4months after the first stage, with the use of posterior stabilized total knee prosthesis (GENESIS II, Smith & Nephew, Memphis, TN) with tibial stem implanted using gentamicin-impregnated cement (Fig. 2c and d). The use of the expanders in the first stage allowed the resection of the scar tissue, allowed adequate soft-tissue coverage, and provided an improved gliding surface for the extensor mechanism. (Fig. 4)Thorough hemostasis was performed and 2 drains were placed in the subcutaneous pocket where the expansors were located. After tourniquet removal, we examined the viability and perfusion of the tissue flaps and proceeded to closure with interrupted subcutaneous layers and skin staples. Although we remove subcutaneous drains when the output decreases to below 50 mL per day, usually around 48h after the surgery, the drain placed in the external aspect of the incision came out in the 1stpost-operative day. This event might have triggered a hematoma formation that demanded surgical evacuation 1week after surgery. Although no germs were isolated in culture, the patient pursued antibiotics for 6 weeks, with good outcome and no signs of infection. At former follow-up, 48 months after surgery, the patient had improved active range of motion from previous10°–20° to 0°–75°without extensor lag. The Knee Society Score improved from 42 to 87 after TKA at the latest follow-up and the patient was satisfied with the results achieved. Wound problem complications are a dreaded complication following TKA, and it is important to avoid underestimation during surgery planning as they may lead to catastrophic TKA failure[7, 8, 9, 10, 11, 12]. Wound complications can be significantly reduced using preventive measures including operative techniques such as raising full-thickness skin flaps, gentle handling of the soft tissues, meticulous hemostasis, judicious placement of skin incisions in the presence of pre-existing scars, and wound closure without excessive tension[8,13,14].Nevertheless,there are certain scenarios that require further soft-tissue optimization. 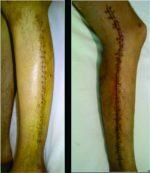 Consequently, soft-tissue reconstruction with soft-tissue expanders or a gastrocnemius flap has been proposed when confronted with multiple previous incisions, if the skin and scar tissue are adherent to underlying tissue, or if wound healing seems questionable. Manders et al. first described the technique of STE in 1984. Since then, it has been applied to lower extremity reconstruction  and to upper extremities. Regarding knee literature, STE has been used in selected cases from revising arthrodesis knees to TKA[18, 19], in two-staged revisions for infection , and in selected cases previous to primary TKA[2, 3, 4].Even endoscopic placement of soft-tissue expanders has been proposed by Sharobaro et al. to reduce the rate of complications (i.e., hematoma, seroma, infection, and wound dehiscence) and the length of time for expansion. To date, the largest series of STE in TKA consist of 64 expansions performed for 59 cases, reported by Long et al., who concluded that STE is a safe, prophylactic technique that provides adequate coverage in this complex subset of patients. Patients who require TKA and present soft-tissue coverage risk factors, or have severe angular deformities, comprise a challenging subset of patients. Reports on the use of STE are limited and most of the series are from the same group, who has extensive experience with this technique . Although the two patients presented in this study suffered subsequent complications that required additional surgery, STE provided an effective alternative to prevent soft-tissue coverage complications. In regard to skin related problems, STE aided to reduce wound-healing complication even allowing multiple successive surgeries. Although we only report the technique on two cases, we believe that it is important to share the usefulness and reproducibility of STE before TKA. STE before TKA provides a valuable alternative in complex scenarios of multiple conflicting incisions or previous soft-tissue contractures and scarring, presenting an effective prophylactic procedure to reduce the risk of wound healing complication. STE before primary or revision TKA is a valuable alternative in complex scenarios of multiple conflicting incisions or soft-tissue contractures and scarring. 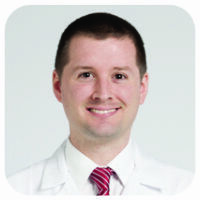 STE presents an effective prophylactic procedure to reduce the risk of wound-healing complication and soft-tissue coverage defect that can be performed by orthopedic surgeons. 1. Galat DD, McGovern SC, Larson DR, Harrington JR, Hanssen AD, Clarke HD, et al. Surgical treatment of early wound complications following primary total knee arthroplasty. J Bone Joint Surg Am 2009;91:48-54. 2. Long WJ, Wilson CH, Scott SM, Cushner FD, Scott WN.15-Year Experience with soft tissue expansion in total knee arthroplasty. J Arthroplasty 2012;27:362-7. 3. Manifold SG, Cushner FD, Craig-Scott S, Scott WN.Long-term results of total knee arthroplasty after the use of soft tissue expanders. Clin Orthop Relat Res 2000;380:133-9. 4. Gold D, Scott SC, Scott N.Soft tissue expansion prior toarthroplasty in the multiply-operated knee: A new method of preventing catastrophic skin problems. J Arthroplasty 1996;11:512-21. 5. Santore E, Kaufman D.Tissue expansion prior torevision total knee arthroplasty. J Arthroplasty 1997;12:475-8. 6. Insall JN, Dorr LD, Scott RD, Scott WN.Rationale of the knee society clinical rating system. Clin Orthop Relat Res 1989;248:13-4. 7. Dennis DA. Wound complications in total knee arthroplasty. Instr Course Lect 1997;46:165-9. 8. Garbedian S, Sternheim A, Backstein D. Wound healing problems in total knee arthroplasty. Orthopedics 2011;34:e516-8. 9. Vince KG, Abdeen A. Wound problems in total knee arthroplasty. Clin Orthop Relat Res 2006;452:88-90. 10. Piuzzi NS, Muschler GF. CORR insights®: Which clinical and patient factors influence the national economic burden of hospital readmissions after total joint arthroplasty. Clin Orthop Relat Res 2017;475:2938-40. 11. Sodhi N, Piuzzi NS, Dalton SE, George J, Ng M, Khlopas A, et al. 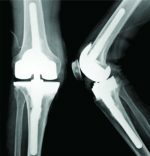 What influence does the time of year have on postoperative complications following total knee arthroplasty? J Arthroplasty 2018 Jun;33(6):1908-1913. 12. Faour M, Sodhi N, Khlopas A, Piuzzi NS, Stearns KL, Krebs VE, et al. Knee position during surgical wound closure in total knee arthroplasty: A Review. J Knee Surg 2018;31:6-12. 13. Dennis DA. Wound complications in total knee arthroplasty. Instr Course Lect 1997;46:165-9. 14. Vince K, Chivas D, Droll KP. Wound complications after total knee arthroplasty. J Arthroplasty 2007;22:39-44. 15. Manders EK, Schenden MJ, Furrey JA, Hetzler PT, Davis TS, Graham WP 3rd, et al. Soft-tissue expansion: Concepts and complications. Plast Reconstr Surg 1984;74:493-507. 16. Manders EK, Oaks TE, Au VK, Wong RK, Furrey JA, Davis TS, et al. Soft-tissue expansion in the lower extremities. Plast Reconstr Surg 1988;81:208-19. 17. Carneiro R, Dichiara J. A protocol for tissue expansion in upper extremity reconstruction. J Hand Surg Am 1991;16:147-51. 18. Mahomed N, McKee N, Solomon P, Lahoda L, Gross AE. Soft-tissue expansion before total knee arthroplasty in arthrodesed joints. A report of two cases. J Bone Joint Surg Br 1994;76:88-90. 19. Cho SH, Jeong ST, Park HB, Hwang SC, Kim DH. Two-stage conversion of fused knee to total knee arthroplasty. J Arthroplasty 2008;23:476-9. 20. 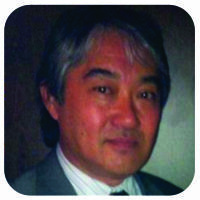 Namba RS, Diao E. Tissue expansion for staged reimplantation of infected total knee arthroplasty. J Arthroplasty 1997;12:471-4. 21. Sharobaro VI, Moroz VY, Starkov YG, Strekalovsky VP. 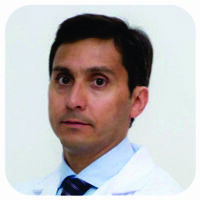 First experience of endoscopic implantation of tissue expanders in plastic and reconstructive surgery. Surg Endosc 2004;18:513-7. How to Cite This Article: Piuzzi N S, Costantini J, Carbo L, Makino A, Boretto J G. Soft-Tissue Expansion before Total Knee Arthroplasty: A Report of Two Cases. Journal of Orthopaedic Case Reports 2018 Jul-Aug; 8(4): 20-24.